Home :: Antennas :: Outdoor Standalone Antennas :: Panel antennas :: ARC Wireless 4.9/5.8GHz 19/23dBi Standalone Panel Antenna with N-female jack and mounting bracket kit (BRA-A-1699-02). ARC Wireless 4.9 to 5.1GHz at 19dBi or 5.1 to 5.9GHz at 23dBi. 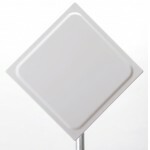 Low profile Standalone Panel Antenna with N-female jack. Bracket allows either vertical or horizontal pole mounting. 10 degree beamwidth. DC Ground for lightning protection. Mikrotik RouterBoard RB4011iGS+5HacQ2HnD-IN-US (US and Canada) Powerful 10xGigabit port router with a Quad-core 1.4Ghz CPU, 1GB RAM, SFP+ 10Gbps cage, dual band 2.4GHz / 5GHz 4x4 MIMO 802.11a/b/g/n/ac wireless and desktop case - New! Mikrotik RouterBoard wAP2nD RBwAP2nD outdoor 2.4Ghz 802.11b/g/n Dual Chain Black wireless access point AP - New! Mikrotik RouterBoard CCR1036-8G-2S+EM Extreme Performance Cloud Core Router with 8-10/100/1000 ethernet ports, 2 SFP+ ports and RouterOS Level 6 license - New! I.T.E. 12vdc 36 watt (3 amp) desktop style switching power supply with Molex DC plug - replacement for current RB1100AHx2 6COM Pair of single mode SFP modules, 6C-WDM-0220AID + 6C-WDM-0220BID with dual LC-type connectors and DDM SXT Lite5 ac - Mikrotik's RBSXT-5HacD2n-US (US and Canada) is the new low cost 802.11ac SXT with 10/100 Ethernet and RouterOS L3 license. New! RB911G-5HPacD (Export version) Mikrotik RouterBOARD 911G with Atheros AR9557 720MHz CPU, 128MB DDR RAM, 5GHz 802.11ac dual chain radio, and RouterOS L3 - New! Mikrotik RouterBoard RB260GSP Smart Gigabit Switch with five-10/100/1000 ethernet ports, POE output, one SFP port, and SwOS - New! Mikrotik Cloud Smart Switch CSS326-24G-2S+RM is a SwOS powered 24 port Gigabit Ethernet switch with two SFP+ ports in a 1U rackmount case - New!